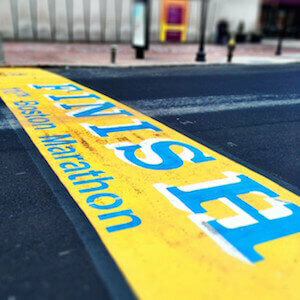 Boston Marathon weekend in the city is filled with energy and pride! There’s a lot happening all around town and this guide is filled with special deals, discounts, specialties, where to eat and drink, street closings and volunteer opportunities in the neighborhood! This guide will be updated daily – so make sure to check back! How does bottomless pasta sound? Capo is hosting an all you can eat pasta fest featuring rigatoni bolognese, pesto gemelli, and spaghetti & meatballs – available family style on Sunday, April 14th! Carb up at MJ O’Connors with pasta specials like Bucatini & Meatballs with parmesan and basil, Chicken Broccoli Pesto with diced chicken, cavatappi pasta, broccoli, and roasted red peppers in a garlic cream sauce, and Gnocchi with peas, mushrooms, and cherry tomatoes in a spicy garlic oil – available Friday, April 12-Sunday, April 14. The Playwright will open for Patriots Day brunch at 10am on Monday, April 15th – perfect excuse to order up a stack of pancakes! Backyard Betty’s is featuring brunch on Monday! Fried dill pickles, chicken and waffles, steak and eggs are just a few of the items of BYB’s brunch menu! Don’t forget Betty’s adult cereal shakes too! Loco is opening at noon for a post marathon party! We’ll be celebrating with beats by DJ Ryan Brown and specials like Mexican Pizza made with crispy flour tortilla stack, jack + oaxaca queso, chorizo, mini sweet peppers, jalapeno crema, cotija, pico de gallo! Don’t miss out! On Marathon Monday head to STATS for a Boston Marathon After Party with DJ Artie V and the Bruins Playoff game on the TV! The Bowery Bar and Lucy’s American Tavern are featuring the Heartbreak Hill for their April Charity cocktail. Enjoy this concoction of Real McCoy rum, blue curaçao, lime, coconut puree and pineapple for $11. $2 goes directly to the Martin Richard Foundation. A garden of modern art will soon sprout in Seaport next month. In a celebratory nod to the Boston Marathon, artist Daniele Frazier will create twenty larger than life daffodils. The installation’s 20-foot daffodils are a colorful array of orange, yellow and green, and made of rip-stop nylon. The hollow-volume forms will spin according to the wind’s direction and will be found in Seaport Common (85 Northern Avenue Boston, MA 02210) from April 8th through April 29th. You can learn more about this here! Whether you’re headed to the race or the ball game, Kings Dining & Entertainment has you covered for all your post-Marathon Monday festivities! Right next to the action at the finish line and a quick walk from Fenway Park, Kings will feature bowling lane packages for groups, D&E specials like $6.99 Buffalo Chicken Pizzas and $10.99 32oz. mugs of Samuel Adams Seasonal beer, and Dine-Then-Bowl reservations to eat a delicious, scratch-cooked meal then jump to the top of the bowling list for some post-meal, post-race fun. Lane packages and reservations can be made at www.kings-de.com/boston and are highly encouraged. To celebrate the race, Ocean Prime Boston will be having a “Medals for Margaritas” special which includes Ocean Prime’s Prime Margarita and a complimentary burger for $16, for those who comes in and show their medal from the race! In addition to celebrating with a refreshing cocktail, feel free to indulge during your celebration with signature dishes such as the 8 oz Filet Mignon, Goat Cheese Ravioli and 10 Layer Carrot Cake. This innovative activewear brand is teaming up with adventure training studio BKBX for a pop-up recovery room in Outdoor Voices’ Seaport shop. The recovery room will be stocked with myopically release tools, including the Vyper vibrating foam roller, Hypersphere and Hypervolt massage guns, and Normatec leg compression sleeves. The BKBX team will be on hand to offer personalized tips on stretching, stamina, and recovery for the big day.Saturday, April 13, 11am – 3pm. RSVP here. Additionally, shoppers will receive a complimentary Outdoor Voices Boston Marathon colored hat with all purchases made April 13-14. Sign up here! While you’re there, save yourself some money with East Side’s One Day Only 5-pack sale for $80! Also, take advantage of a free class if you’re running the marathon. Bring in your bib for a free class April 16th- 21st! Choose Kindness – Pitch in! Pray for us runners! Our Lady of Good Voyage/Seaport Shrine is hosting a special mass for all the participants of the Boston Marathon on Sunday, April 14th after all masses (9:30am, 11:30am and 7pm) with a special blessing for the runners! Wondering about traffic, where to park and what streets will be closed? The City of Boston has some handy information you can read here!